One of my favorite dishes to eat during the rush of a busy week is a casserole. I love putting this together during the weekend and pulling it out in the middle of the week when I’m just about tired of cooking dinner. This also makes a great Sunday dinner with a side of dinner rolls or your favorite bread. This recipe came about after the initial diagnosis of Kelsie’s allergies. One of our family’s favorite meals was Grandmother’s Chicken and Rice Bake by Stouffers. After the diagnosis, we were reading the list of ingredients and noticed A)she couldn’t have it anymore, but more importantly B)holy moly at the list of “what is that?” in there! I knew that I could make this from scratch and make it better then what came from the frozen food section. Since then we eat this at least once a month. It’s filling and delicious! 1. Mix together your chicken, rice, cream of soup, yogurt, and peas and carrots until thoroughly combined. 2. Bake at 350 degrees for 30 minutes. 3. While that is baking mix together heat up some oil in a small pot. 4. Mix your flour with enough water it makes it a little looser than pancake batter. Toss your onions the batter and add a few at at time to the hot oil. Fry them up in small batches, laying on paper towels to drain, and salting well. Set aside. 5. 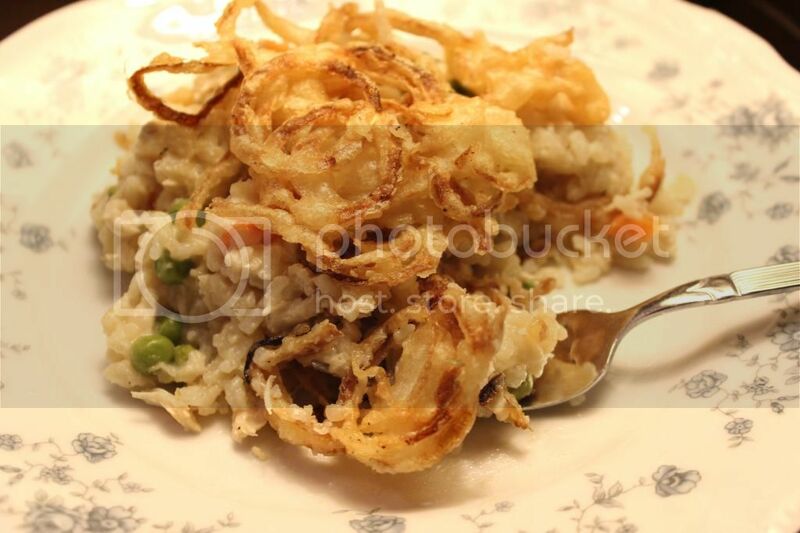 At 30 minutes pull your chicken and rice bake out of the oven and top with the onions. Serve! -Melt your butter in a small sauce pan and add the flour. Mix together and whisk in your milk and broth slowly, making sure to incorporate it well. Don’t just pour it all in and stir, it won’t come together right. Over low heat, continue whisking until the mixture is slightly thickened. It will thicken more as it sits. -Melt your butter in a large skillet with a lid. Add rice, stir to coat with the melted butter. Add your broth and spices, bring to a boil. Simmer and cover 10-15 minutes or until rice is done. It will be a bit soupy, that’s ok. Remove from heat and allow to sit 5 minutes. Mix together your chicken, rice, cream of soup, yogurt, and peas and carrots until thoroughly combined. While that is baking mix together heat up some oil in a small pot. Mix your flour with enough water it makes it a little looser than pancake batter. Toss your onions the batter and add a few at at time to the hot oil. Fry them up in small batches, laying on paper towels to drain, and salting well. Set aside. At 30 minutes pull your chicken and rice bake out of the oven and top with the onions. Serve! -Melt your butter in a small sauce pan and add the flour. Mix together and whisk in your milk and broth slowly, making sure to incorporate it well. Don't just pour it all in and stir, it won't come together right. Over low heat, continue whisking until the mixture is slightly thickened. It will thicken more as it sits. -Melt your butter in a large skillet with a lid. Add rice, stir to coat with the melted butter. Add your broth and spices, bring to a boil. Simmer and cover 10-15 minutes or until rice is done. It will be a bit soupy, that's ok. Remove from heat and allow to sit 5 minutes.